How to get rid of this?.To get a pest problem under control, inspection is the first and foremost step. An infestation of bed bugs is not evidence of unclean or unsanitary living areas, but it is a definite sign that you need bed bug elimination immediately. 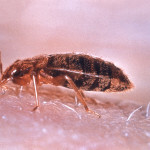 Bed bug infestations usually begin with just a few bugs brought into a structure with clothing, luggage or by the purchase of used furniture or bedding. PEST CONTROLProudly serving Akron, Cleveland, and Canton. Our technicians perform a careful inspection to identify if bed bugs are present. If bed bugs are found, we will recommend a treatment based on the needs and concerns of the client. This treatment will require the full cooperation of the client to be successful. If you think you have bed bugs, don’t hesitate to call. Our trained bed bug inspector can respond to your calls within 24 hours. Click here for bed bug treatment preparation instructions. A-Best Pest Control can prevent bed bugs from becoming a permanent guest. CALL TODAY.